Some people have told me the grass is greener on the other side and that I would eventually switch everything to Mac’s. Others have said that once I touch a Mac I’ll never want to touch Windows again. And I’ve been told that I should be prepared to meet with some archaic ways of doing things combined with suffering a Unix after-taste. I’ve never opposed Unix, Linux, or any variants thereof, though. It’s an acquired taste I’m not unfamiliar with so wasn’t all that concerned about it. I wanted one of those flat tiny keyboard and got one. The rest of the stuff, like the big monitor, just came with it in the box. Shel Holtz recently created an Apple-free life for himself. What he didn’t notice is that it caused a massive imbalance in the universe that had to be corrected before any disasters started to happen, like hurricanes and oil-spills, whoops, ok, I’m probably responsible for the oil-spill… should’ve bought the iMac sooner! I once wanted a smaller digital camera and ended up with enough professional Nikon gear to use as a down-payment on a house. I recently wanted a lighter laptop to travel with and ended up with a monster heaviest-ever Clevo D900F. The other day I went into the Apple store and *this* is what I walked out with. The trend clearly continues. Dennis Klein twisted my arm and forced me to get one! I wanted to get an iPhone but heard the camera was puny and the screen was too small. I asked the people in the store if they had something with a bigger screen and a better camera. The iMac is what I walked out the store with. After much research I decided not to get an iPhone because employees at Foxxcon are experiencing enormously high rates of suicides. I figured it was safer to buy an iMac and use the XCode development tools to simulate apps on the iPhone. Now Foxxcon employees can simulate their suicides. We all know Steve Balmer has a tendency to throw around iPhones and make fun of Macbook Air’s like Guy Kawasaki’s. I needed to avoid him picking up my Mac without benchpressing a few more pounds so decided to get a Mac that is more difficult to throw around. I had to replace the 10th reason with a new one because the original 10th reason was “because it’s such a nice nearly-Autodesk-free platform”. Except, shortly after I ordered the iMac they decided to announce AutoCAD for the Mac, this after 20 years between releases (a new world record!). So that reason doesn’t fly. To preempt any potential assumptions; this move by Autodesk has absolutely nothing to do with my reasons for getting a Mac, at all, none whatsoever. Various dock applications that were based on the OSX dock have more configuration options than the original ‘real’ dock. Nice to see SMB compression push network file transfers to 1.5Gbps (often peaking at 1.7Gbps). Of course, a solid 1Gbps is sustained when files being copied over are already heavily compressed. Time machine; nice concept but darn that thing is slow as HECK! I can’t imagine it being useful for real work and large numbers of large files. I’ll be setting up my own sync and backup scrpts and rely on SMB and FTP shares on my network instead. XCode actually feels very nice. It’s not Visual Studio and I don’t like the typical Mac style of having windows all over the desktop but it feels solid and quite complete. I was pleasantly surprised since I expected the OSX development tools to be more archaic and draconic. In a way they are but not nearly as bad as I feared. Getting up and running with it was very easy. I already prefer to work with the XCode 4 beta (but I’m not supposed to ramble about that, I believe). I really like XCode’s snapshot feature. I often find myself making experimental changes to code (without recording those changes in any SCM). The fact that it is integrated with a diff view is great. When using Visual Studio I have external workarounds to accomplish the same thing but having it right in the IDE is, well, real nice! They say working on an Apple Macintosh, with OSX, makes you feel real good. While I can neither confirm nor deny that I must say the feeling of using XCode Instruments to track a few zombies that were the result of some stupid use of autorelease felt… great! To conclude, after a little experimentation I admit that there’s a lot of interesting and nice features about OSX but not enough to make me ‘a convert’ (not that there was any chance of that in the first place, though even while it was funny to mess with people’s heads as they learned that I decided to put my hands on a Mac). Disclaimer: No Mac’s were harmed in the process of experimentation! You can see images of the new additions to the Home Office in another blog post. so… this means that u will be using a Mac? and may be u will become a “switcher”. You and I have corresponded in the past and you were very helpful with getting me started with Synergy. 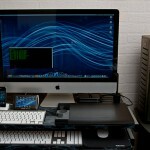 I am pretty much a dual-platform guy, but use a MacBook Pro primarily. The main reason was because I could have Windows running in VMWare Fusion with 3GB of RAM allocated and still have 5GB left over for other creative and working apps like Mail, Photoshop, Dreamweaver, etc.